story by Sarah ~ jux.ta.pose - vb (tr): to place side by side, especially for comparison or contrast. 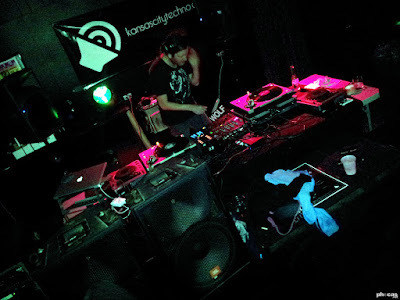 That is the idea behind the latest monthly electronic music night from KansasCityTechno.com. The last Friday of every month DJ's of genres from all ends of the music spectrum hold down the Uptown Arts Bar, on Broadway in Kansas City. 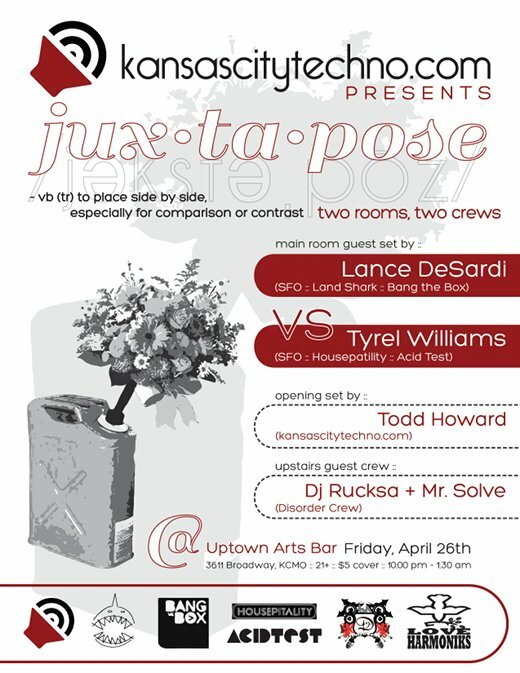 April featured house DJ's Lance DeSardi and Tyrel Williams (San Francisco) in the main room, and drum and bass DJ's Rucksa and Mr. 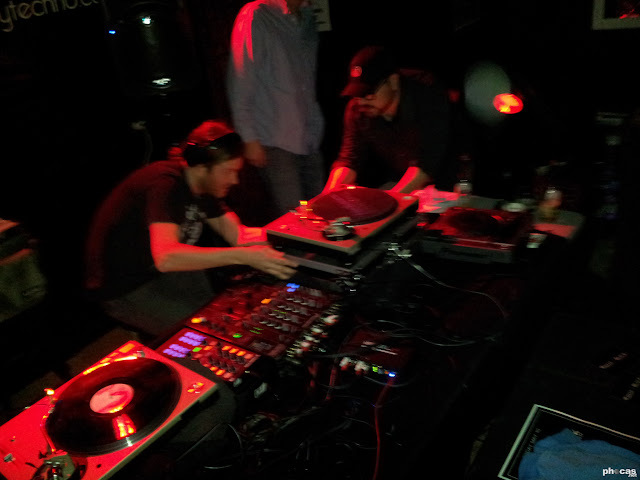 Solve (Disorder Crew) holding down the upstairs room. This night has become one of my favorite events in the city, hands-down. KansasCityTechno.com resident Todd Howard opened up the night with some smooth deep house, and got the dance floor warmed up nicely. Howard has a knack of building his sets that I have rarely witnessed. Whether he's playing CD's or using Serato, he really takes care to program his sets to keep you into it from start to finish. The technology that has come to DJing over the last few years has really allowed DJ's to be mobile with their music, as well as creative in new ways. Williams and DeSardi then took over, with their all-vinyl tag-team set that kept the dance floor hot all night long. I love shooting DJ's whom you can see their passion for what they do, whether it be playing CD's, vinyl, or using the latest technology with Serato or Traktor. I am newer to the electronic music scene, unlike some that have been going out to parties for years and years, seeing shows where DJ's lugged crates and crates of vinyl to every show. So watching Williams and DeSardi flip through their records, pulling those that make the cut for their set, placing the record on the turntables, and setting the needle on the record is exciting and gets my anticipation up. Watching a vinyl DJ play is something to see as well. 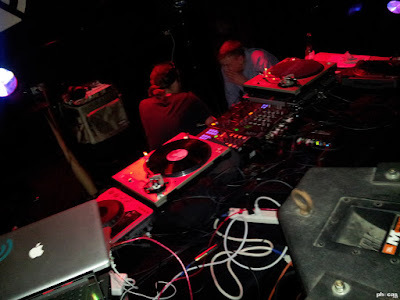 When you see the DJ lean in to get the needle in the right place, you see them make that connection to their music, sometimes down at needle-level. Disorder Crew held it down proper in the upstairs room with drum and bass. 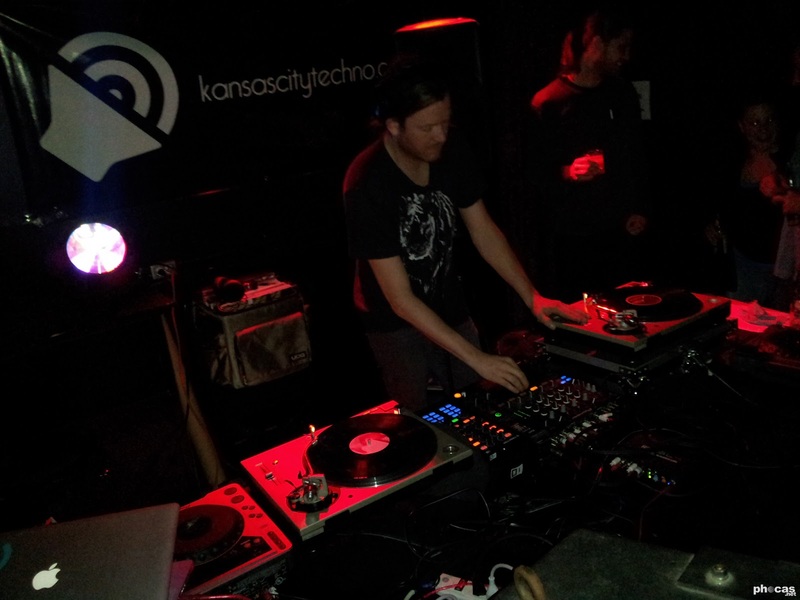 They have been part of the Kansas City electronic music scene for a number of years, starting out on vinyl, and incorporating the newer technology as well. 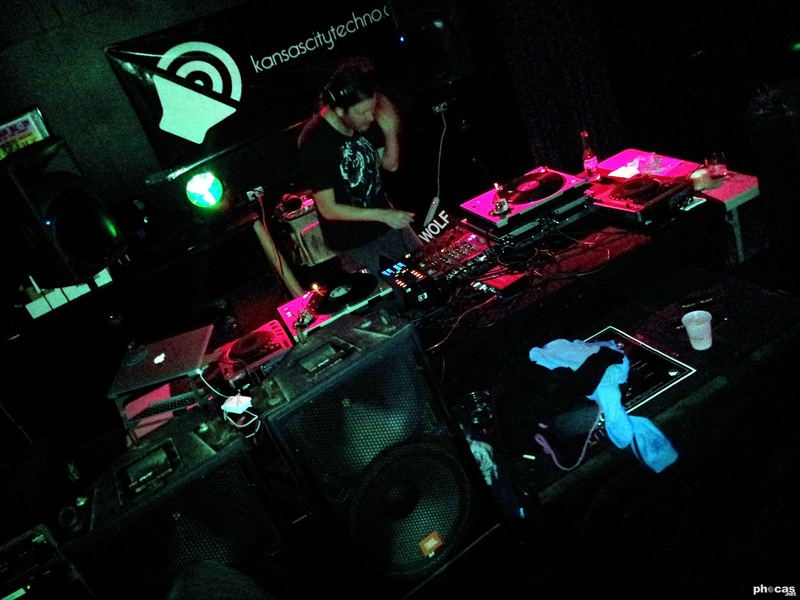 Disorder Crew also holds down a weekly Disorderly Conduct Radio Show on www.dnbradio.com each Wednesday. When the dance floor is moving, I am shooting. I look for people who are having fun, getting down, in the zone. When someone is feeling the music, you can see it in their face, in their movements. That's when I shoot. Thanks for taking a look at my photos; I learn something new every time I pick up my camera, and I strive to incorporate what I've learned the next time I'm out and about. Note... original photos lost in the shuffle, only these 4 remain.